With sweeping marijuana legalization, medical use allowed in most states and a new outlook on the federal level, the once taboo plant is now exploding in popularity and use. Similar to alcohol or guns, this new adult category needs to be properly stored and secured from children and unauthorized users. This is exactly why Stealth developed the Personal Marijuana Safe. Beginning with a high security UL Approved NL electronic lock this Personal Marijuana Safe uses the same level of security found on top tier Gun and Home Safes at a fraction of the cost. Tested and rated at 99.99% reliability, this lock is now considered the most reliable lock in the safe industry. Once the correct 6 digit pin code is entered and you turn the secure chrome handle, you'll notice two solid steel locking bolts protected by a ½" thick door. 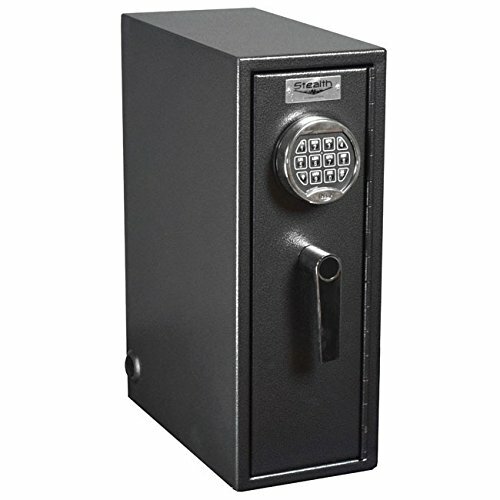 The overall door thickness comes in just under 2" and when combined with the anti-pry door tabs, this safe becomes a tough marijuana fortress. Once inside the safe, you'll notice three conveniently placed rubber lined shelves perfect for storing pipes, bubblers, marijuana containers and other smaller cannabis accessories. With its vertical design, the Stealth Marijuana Safe is ideal for storing water pipes, bongs and larger glass pieces up to 18" high on the left side. This marijuana security container allows you to be able to store all of your cannabis equipment in one convenient safe. Located in the rear of the safe are two 1" grommeted holes that are just big enough to run a power cord through making this safe ideal for being able to charge your electronic marijuana accessories while safely stored inside the safe. To ensure someone doesn't just pick up the entire safe and steal it, Stealth added four bolt down holes and included four large screws to bolt the safe down as well as a free security cable that can be wrapped around any fixed object.